From clients and business associates to employees and vendors, Wolferman’s has something for everyone! We offer the best quality and service available and we’re thrilled to present unique and tasteful gifts for any occasion, to fit any budget. Our corporate programs can be easily customized to cater to your specific needs, and our dedicated corporate specialists are available to assist in creating a program just for you. 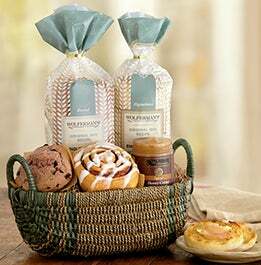 Say “Congratulations!” or “Thank you for your hard work!” with one of our popular gift baskets or towers. Customers are key to any successful business. Let them know just how much their business means to you! Partner with us to build new business relationships – send the very best gifts available. A thoughtful addition to any gift, personalized greeting cards can include your message, logo, graphics and signature. Click here to see all Business Greeting Cards. Please note: Personalized greeting cards are not available for gifts shipped overnight express or gifts shipped to other countries. For these gifts, standard shipping label greeting is available. You can reach our Corporate Department by calling (800) 798-6234, or simply e-mail your questions or comments to corporategifts@wolfermans.com. One of our dedicated corporate specialists will be in contact with you shortly. Our reputation for exceptional quality and superior service is unsurpassed, and your complete satisfaction is our top priority. If for any reason you are unhappy with the products and service you receive, simply call us and we will promptly take care of your concern with a replacement or refund.